I love the texture and feel of cuddly plush fur fabric, a.k.a. "Minky". 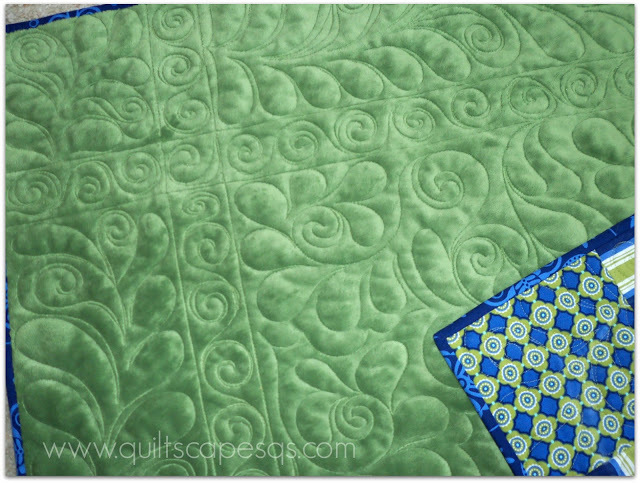 This soft-as-mink (hence the name) polyester fabric is finding its way in to more and more quilts. I'm guessing the name "minky" is now synonymous with all brands of this type of product because that was the first brand available - much like we call all tissues "Kleenex". There is a huge variety of colors, designs, textures, stretchiness and quality of this stuff. I especially love it for backing on baby quilts and lap throws, as it comes 60-inches wide. 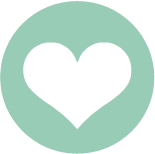 My preference is Cuddle Soft - I can always find the color I need, and can depend on the quality. 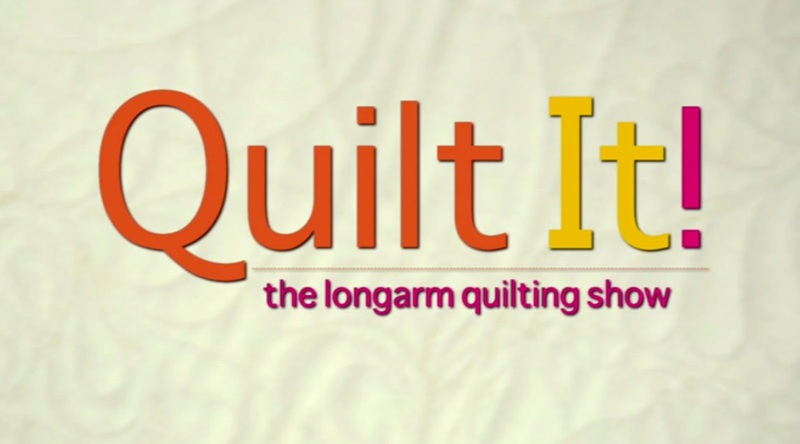 It's not as stretchy as other brands I've tried, so it works beautifully for longarm quilting. That sounds like a commercial - but as always, it is my own, unsolicited opinion. 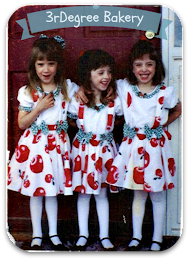 And kids (big kids too, lol!) just can't keep their hands off! Here are some samples. My friend Pat Wodskow does some contract work for Shannon Fabrics, the makers of Cuddesoft products. She and I go way back - I babysat her kids when I was a teenager back in our little farm town of Archer, Idaho. 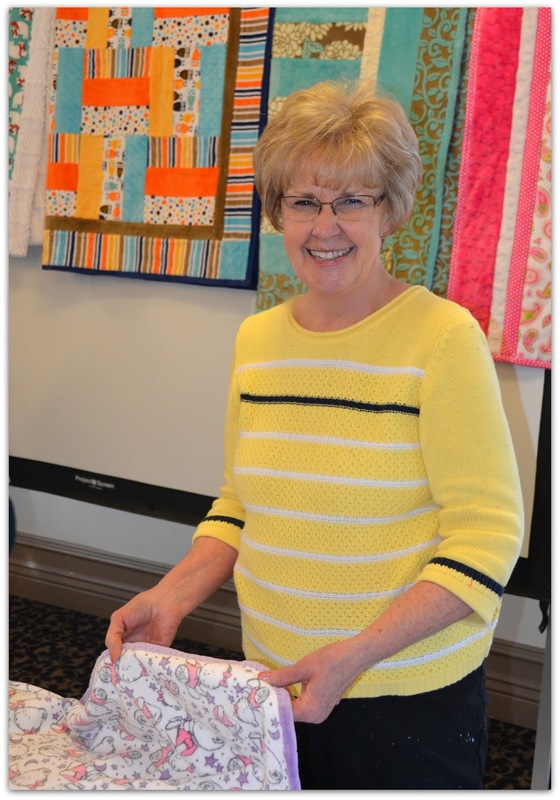 Pat recently presented a workshop at the USU Sewing Training Seminar for FCS (Home Ec) teachers and 4-H volunteer leaders from around the state of Utah. 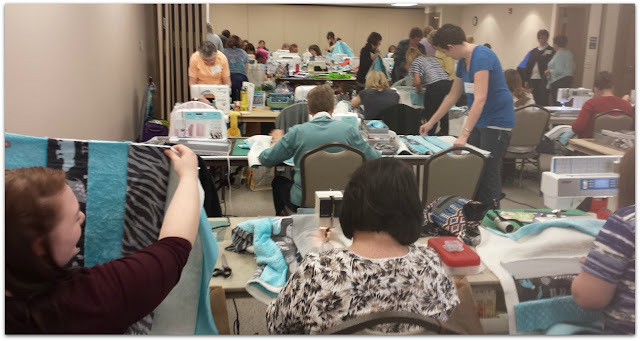 Shannon Fabrics donated a kit to each of the 100 attendees to learn to sew with this luscious stuff! 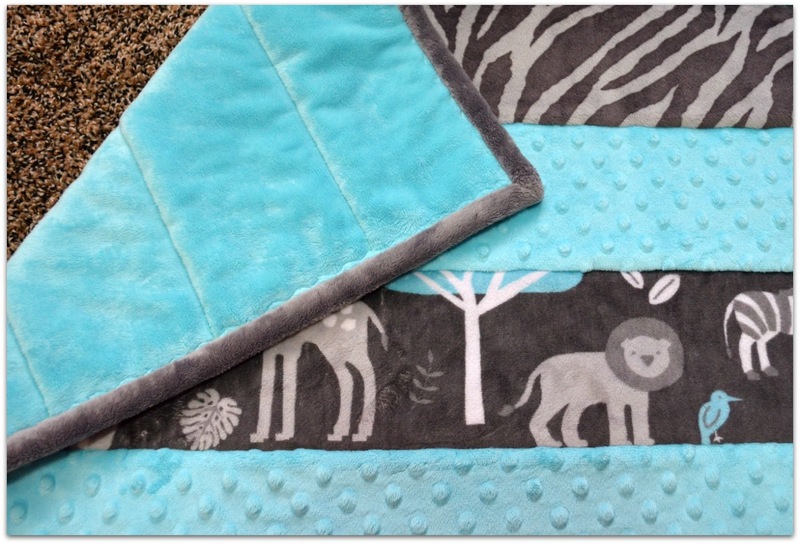 It was a simple quilt-as-you-go baby quilt, and yes, the fur was flying! Luckily, Pat brought a couple of small shop-vacs to keep it under control. We used 505 temporary spray adhesive to adhere the backing to the batting and set the first strip in the center. 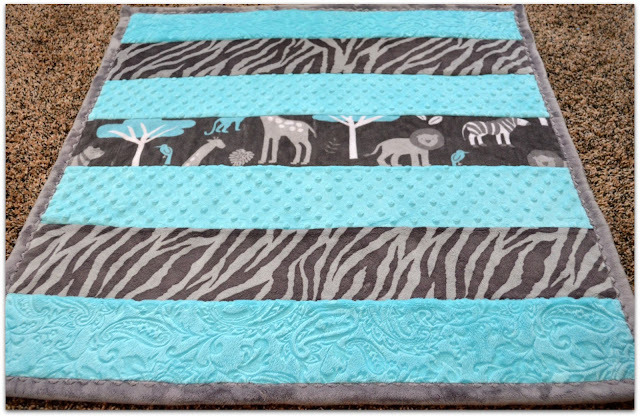 The additional strips are sewn to each side of the center strip, stitching through all the layers to quilt at the same time. 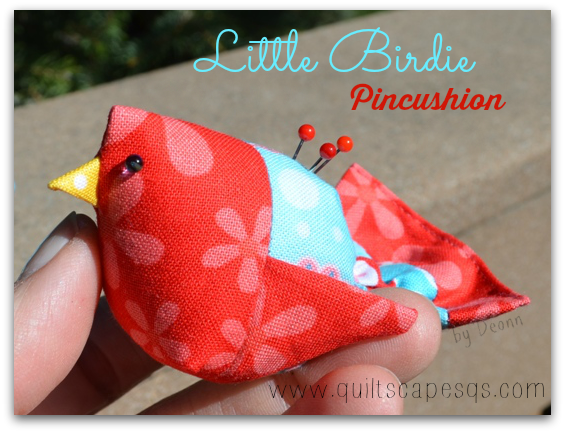 I used my walking foot to stitch, and basically pinned it to death so the layers wouldn't slip. We used a glue stick to tack down the sewn strips to keep them in place to add the next strip. Normally, she would spray the 505 adhesive to keep the strips in place, and 505 is the least noxious spray adhesive out there, but with 100 quilters... well, a glue stick worked great. In just a couple of hours we finished our quilts, complete with binding! This binding is made with 2" single-layer strips. 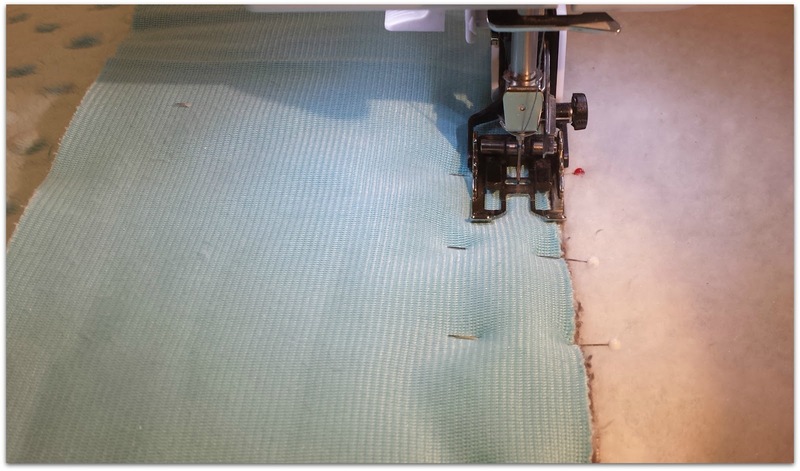 Join the strips to the length you need, then apply to the back using 1/2" seam allowance. The corners are mitered, and the binding is brought around to the front and machine-stitched using a serpentine stitch. 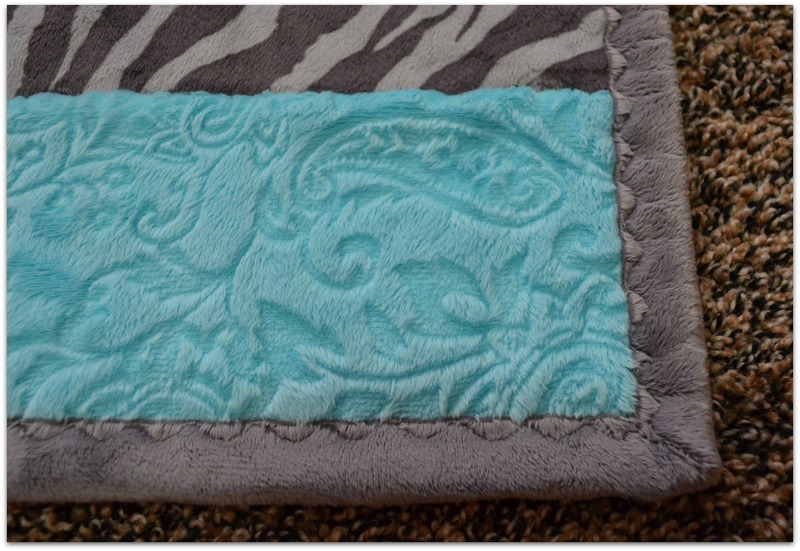 See my plush fur binding tutorial HERE. So adorable and soft! 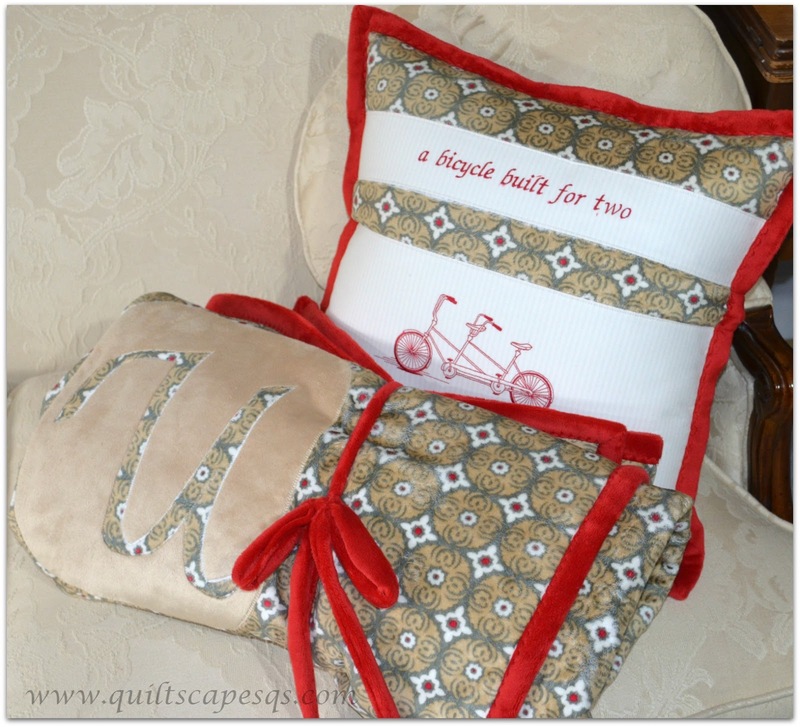 A huge thanks to Shannon Fabrics for the kits and to Pat for her wonderful classes. Now these teachers can pass on the technique to their students. Check out more at Pat's website, Cuddle Soft Kits. 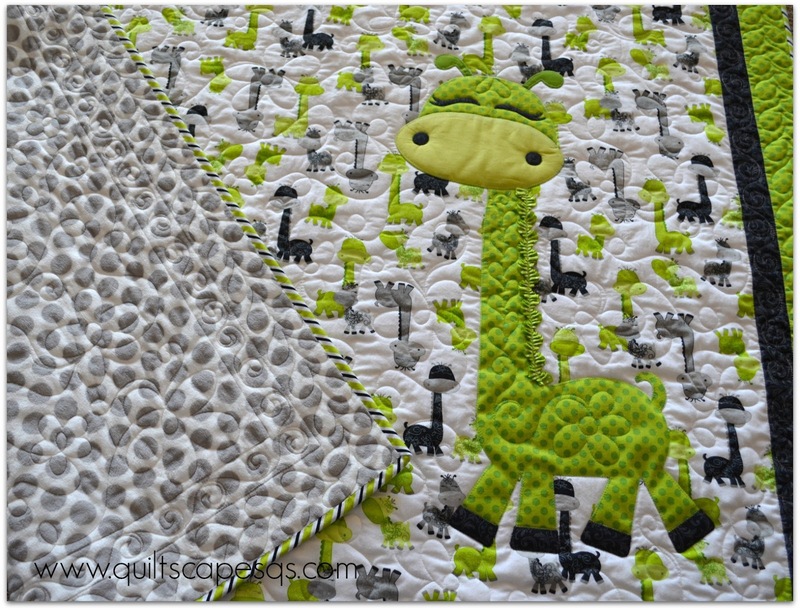 And yay for baby quilts!! My sweet little grand-niece Anna was born a few months ago. Her grandma gave me a hunk of fabric that was too cute to cut - perfect to make a Simple Sadie quilt. The minky backing is a cute gray polkadot that matched the quilt perfectly. Not sure what brand this was, but it quilted up beautifully, so soft and cuddly! Binding is a cute diagonal stripe cotton to tie the prints together. 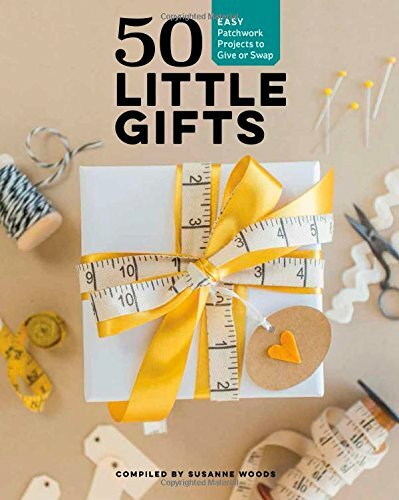 Here's another super soft, super-sweet project. I'm on the birthday committee with my choir group, and we made these comforters for some special people. 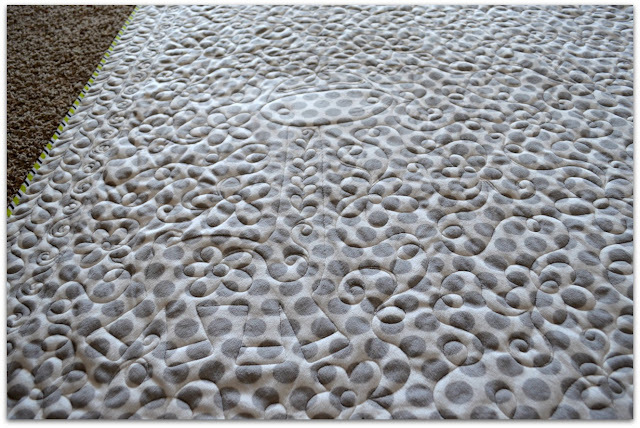 They're two-sided comforters - 60" x 72", no batting, with a wide minky machine-binding around the edge. We used a little 505 spray adhesive to adhere the layers together, trimmed the edges even then added the binding. Love these designer prints! 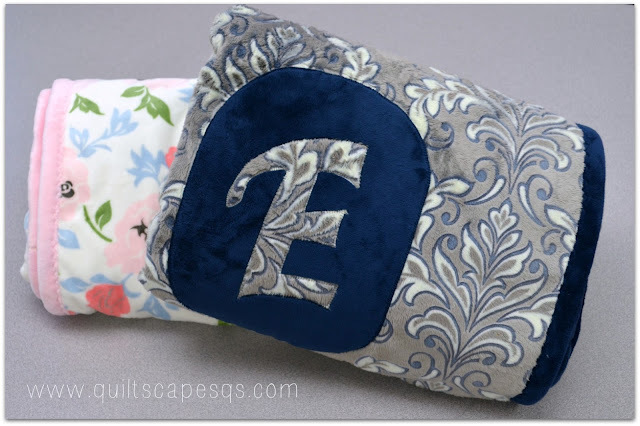 We applique'd the monograms using Heat'n'bond Lite fusible web to adhere, then blanket-stitched by machine. I'll bet we could have used 505 spray to tack the applique' in place too... have to try that next time! Soft, warm, comfortable, snuggly, luscious, cuddly, and did I say soft? I love it! If you've never worked with this yummy fabric, I've put together a list of tips on cutting, pinning, sewing, pressing, quilting, binding, care and cleaning. 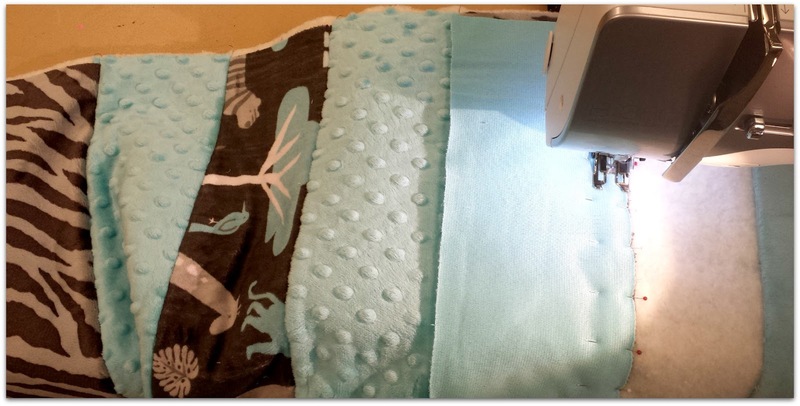 Here's the link, or click the button below for a printout: Best Tips for Sewing with Plush Fur. 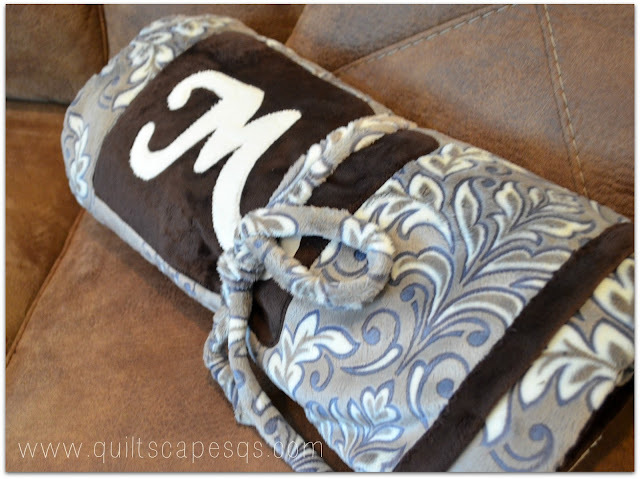 Great article and tips on using minky and similar fabrics! I used it for the first time a decade or so on a baby quilt and fell in love with the results. My husband *demands* it on the back of his throws - says there's "magic in minky". I made him a minky travel mini-quilt and it's the first thing that gets packed :-). I wish I'd had all your great tips when I started using it, but I learned over the years. I, too, use cuddle soft a lot because it stretches a little less. It seems a bit less plush than minky, but my long armers like working with it more. 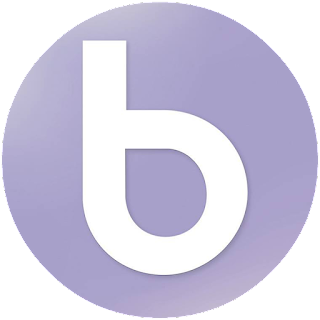 Thanks for creating this very useful resource! 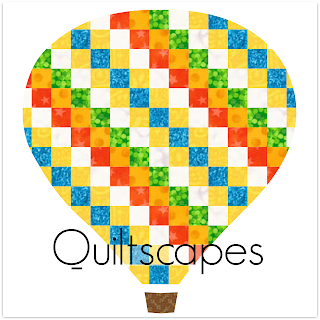 Great quilts and love your quilting. What a great class that looks. I haven't seen the patterned minky here in New Zealand so may need to do some online shopping.